Despite what I said in my last post about needing a photograph of two of my muses, I’m actually lousy at taking pictures. I get caught up in moments and just forget all about capturing images–that’s why I don’t have an Instagram account and probably never will. In the case of the muse photo that I’m going to attempt to get on Friday evening… Ah, to what astronomical lengths I am willing to go to appease my muses and fulfill my passion!…it’s necessary. This image below, however, is definitely a rare catch. Not what you’re seeing, but the fact that I photo-documented it. 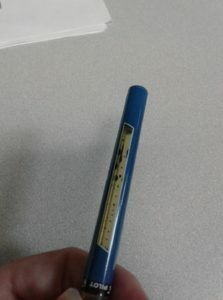 It’s my last Fine Point Pilot Precise V7, blue. That’s actually a cause for mourning because it’s the kind of pen I use to do all of my story writing with–and they are hard to find unless I order them from Amazon or go to the black market or something (just kidding on that second part…although…) I am also mentioning this because I only JUST started using this pen about a week ago. That is the entirety of “Papercuts” and a chunk of “Cradled”. It’s a nice gauge of progress anyhow. There you go. Maybe the next image will be a little more thrilling. PS: I caved to the tidal wave–“Staged” has begun.